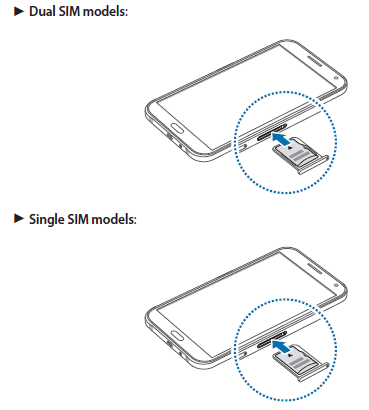 In the Samsung Galaxy E5 user manual you can learn about getting started for example Device layout on page 8, Using the SIM or USIM card and battery on page 10, Installing and formatting a memory card on page 18, Turning the device on and off on page 21, and Locking and unlocking the screen on page 21. Then about basics for example Using the touch screen, Home screen layout, Installing or uninstalling apps, Viewing help information, Power saving feature, Tethering and Mobile hotspot, using Wi-fi, bluetooth, Setting wallpaper and ringtones on page 52, Transferring data from your previous device, and Setting up accounts. 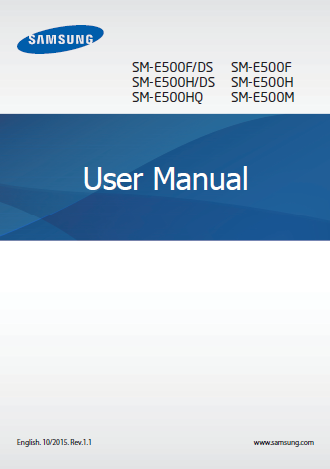 Other information such as about Making calls, tutorial Importing and exporting contacts on page 62, Camera settings, using Google maps, using NFC, mobile printing guide, Backing up and restoring data, Performing a data reset, Troubleshooting and more. Insert the ejection pin into the hole on the memory card tray to loosen the tray. Pull out the memory card tray gently from the memory card tray slot. Place a memory card on the memory card tray with the gold-coloured contacts facing downwards. Insert the memory card tray back into the memory card tray slot.